It’s Summer in the Northwest and the aroma of hops is in the air. Next Friday, August 1st, is National IPA Day and it’s also nearly time for the annual crop of fresh hop ales to start showing up. 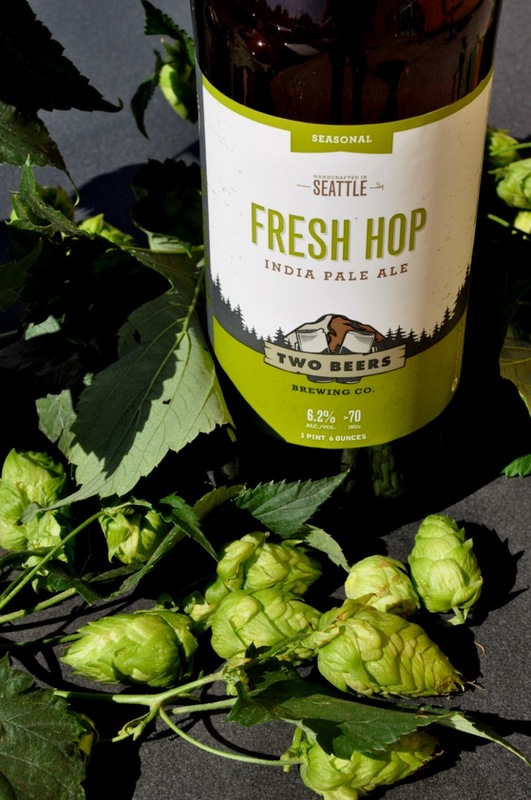 It looks like Two Beers Brewing Company (CBM Sponsor) will be first out of the gate this year with their 2014 Fresh Hop IPA, which is set to make its debut on Saturday, August 9th at The Woods – the taproom Two Beers Brewing shares with their sister company, Seattle Cider Company. 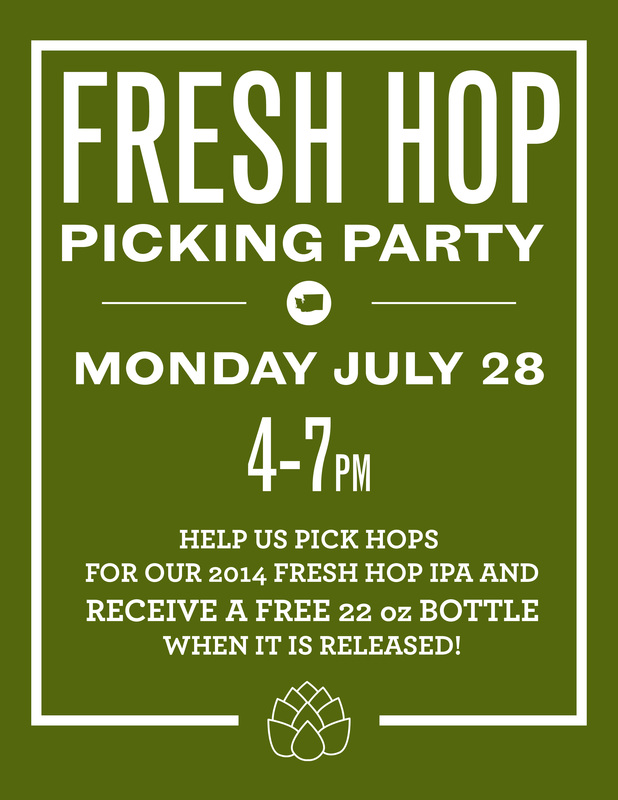 If you’d like to be involved with helping Two Beers make this year’s Fresh Hop IPA, your chance is coming up this coming Monday, July 28th. On that day, from 4:00 PM to 7:00 PM, head down to The Woods (4700 Ohio Avenue South, Seattle) and help Two Beers pick the hops for this special ale. Fresh hop vines will be trucked in from the Yakima Valley right to The Woods, and they’ll need as much help as they can get all the hops off the vines and into the brew. You’ll score a free 22oz bottle for your efforts when it’s released. Also returning on August 9th is Two Beers Brewing’s popular Pumpkin Spice Ale. That’s right. It may still be Summer, butit’s time (especially if you’re a brewer) to start thinking about Pumpkin Ales. With notes of clove, cinnamon, allspice and fresh pumpkin, Pumpkin Spice Ale just tastes like Fall is on the way. It even won a gold medal at the 2013 Washington Beer Awards. The release of both Fresh Hop IPA and Pumpkin Spice Ale on the same day would be enough for just about any brewery, but not for Two Beers. Also returning on August 9th will be their popular High Divide Double Blonde Ale. Part of Two Beers’ popular Alta Series, High Divide is a delicious, high gravity (8.9%) ale brewed with honey malt, fresh Wenatchee peaches and cherries. After brewing, it’s then aged in white wine barrels for a full 4 months, imparting a dry oak character that compliments the fruity finish. As a bonus, Seattle Cider Company will also be releasing their Pumpkin Spice Cider on August 9th. That makes a total of 4 exciting releases all happening at The Woods on the same day! SEATTLE (July 24, 2014) – Thanks to a rainy spring and record breaking temps in Eastern Washington, Two Beers Brewing’s 2014 Fresh Hop Ale is scheduled to be released on tap and in bottles at The Woods tasting room on Saturday, August 9. First brewed in 2009, Fresh Hop enters its sixth season on the brewery’s fall lineup with its earliest release date yet. A hyper seasonal, the expanding brewery’s Fresh Hop Ale is know for its intense hop flavor and unique brewing process, which involves a same-day round trip to Yakima, four hours of picking fresh hops off the vine and a 24-hour brewing process. Guaranteeing this is one party you won’t want to miss, August 9 also marks the release of Two Beers Brewing’s popular Pumpkin Spice Ale and the third beer in its limited edition Alta Series, the High Divide Double Blonde. 2014 Fresh Hop Ale (unknown IBUs, 6.2% ABV): This Northwest-inspired brew’s strong citrus aroma – featuring hints of grapefruit and passion fruit – can be attributed to the freshly picked Yakima Valley-grown Centennial hops from Puterbaugh Farms used to create it. Dark straw in color with light caramel malt tones, 2014 Fresh Hop resembles an aggressively dry-hopped IPA, but packing the punch only fresh hops can deliver. 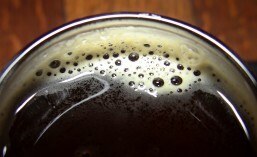 In addition to Centennial hops, this beer features locally grown Simcoe, Amarillo, Cascade and experimental hops, helping this popular beer achieve its bright and delightfully bitter flavor. Draft, 22-ounce bottles. Available until gone! Pumpkin Spice Ale (19 IBUs, 5.2% ABV): Bright, clean and spicy, this small-batch fall seasonal presents clove, cinnamon, allspice and natural pumpkin in a festive and refreshing ale. Awarded a gold medal as part of the 2013 Washington Beer Awards, recognized by as Best Washington Agricultural Product Inspired Beer. Draft, 22-ounce bottles. Available Aug – Oct.
Alta Series High Divide Double Blonde (42 IBUs, 8.9% ABV): The third beer release as part of Two Beer Brewing’s limited edition Alta Series, this unique high-ABV style is perfect for the warmer days of summer. Brewed with honey malt, fresh Wenatchee peaches and cherries, High Divide was aged in white wine barrels for four months, giving it a dry, oak character complimented by a fruit finish. Draft, 22-ounce bottles. Available Aug – Oct. Celebrate the release of these exciting beers on Saturday, August 9 at The Woods tasting room in SoDo (4700 Ohio Ave S) from 1-10pm. Pints and tasters will be available for all three beers (prices vary), with 22-ounce bottles of Fresh Hop ($7), Pumpkin Spice ($6) and High Divide ($14) available for purchase. As a special bonus, sister company Seattle Cider Company will be celebrating the release of its seasonal Pumpkin Spice cider the same day, available on tap and in 22-ounce bottles. Grab a bite to eat for $6 at the pig roast happening on the loading dock in front of the tasting room, which includes pork, chips and a piece of fruit. Enjoy a pig raised on our very own spent grain at Wayne Horton Farms. Fall seasonals will be available on shelves and on tap beginning August 12 throughout Washington, Oregon, Alaska and Michigan. They can also be enjoyed while available at The Woods tasting room in SoDo, shared with Seattle Cider Company, where craft beer and cider lovers can enjoy pints, tasters, packaged products and more. For more information, follow Two Beers Brewing on Facebook, Twitter (@twobeersbrewing) and Instagram (@twobeersbrewing), or visit www.twobeersbrewery.com. Be sure to mark your calender now for this amazing day of beer and cider releases. Join Two Beers and Seattle Cider down at The Woods on August 9th to enjoy pints and tasters of each release, and pick up a few bottles to go. If you get hungry while sampling all of these releases, don’t worry. As noted above, Two Beers will be having a pig roast right on the loading dock in front of The Woods. Grab a plate for just $6. Don’t miss it. This entry was posted in Beer, Beer Ingredients, Beer Release, Brewing, Cider, Cider Release, Events, Fall, Food, Holiday Beers, Hops, IPA, Pumpkin, Seasonals, Seattle, Single Hop, SoDo, Summer, Tasting and tagged 2014, August, Beer Release, Cider Release, events, seasonal, seattle, Seattle Cider Company, SoDo, two beers brewing. Bookmark the permalink.